Sweyn "Forkbeard" Haraldsson is known - some might say infamous - through Scandinavian and British history alike as a very ambitious, ruthless and bloodthirsty king, as well as for his cleft beard. Born around 960AD, Sweyn was the eldest child of the wise Danish and Norwegian King Harald "Bluetooth", who was attributed to unifying Denmark under a single banner. Having been born pagan, Sweyn along with his father was baptised in 965AD. He was well educated in history and practical attributes such as farming and ship building. He was, however, born into a turbulent time in Scandinavian history, with large parts of Norway and Denmark still at war. Sweyn's father Harald had been raiding many parts of the south of England including Southampton, Devon, Cornwall and Dorset over a period of four years, and due to his father’s absence during his early adult life Sweyn was partly raised by the Jomsvikings: a legendary order of well organised Viking mercenaries, who reputedly would fight for any ruler or lord with enough money to pay their substantial fee. They were known for their highly selective methods on whom to admit into the order. 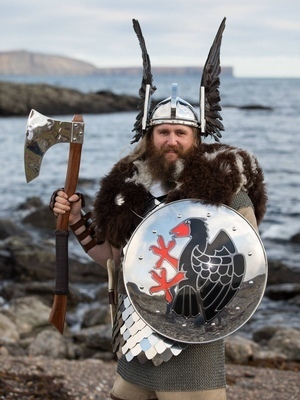 Membership was restricted to men with proven valour, between the age of 18 and 50, and in order to become a full member prospects would have to prove themselves in a feat of strength, or take part in a ritual duel with a Jomsviking. Upon admission, the Jomsvikings had to adhere to a strict code of conduct. Any violation of the rules could be punishable by immediate expulsion from the order. Each Jomsviking was bound to defend his brothers, as well as to avenge their deaths if necessary. Jomsvikings were forbidden to show fear or flee from an enemy of equal strength. Sweyn is known to have compared his membership of the Jomsvikings to like being in a pack of wolves, due to the organisation and efficiency of his co-warriors in combat. Sweyn, now known as Forkbeard, was often accused of being a bully or the instigator of fights and quarrels, and he was accused by many of persecuting the Christians, sending German bishops from Scania and Zealand, and of even betraying his own father. Forkbeard was sent into exile by the German allies of his father for a number of years, and was deposed by King Eric the Victorious, who ruled Denmark. In the year 986AD, aged just 26, Forkbeard returned and led his first military campaign. Along with Jomsviking leader Palantoke, he fought against his father's army on land and sea, culminating in the violent death of Harald "Bluetooth" himself. Forkbeard won his father's throne and was crowned King of Denmark and Norway, and he now had full control over a very powerful Scandinavian army. In 991AD, Forkbeard followed in his late father's footsteps and began a series of raids on England, and they were as numerous as they were brutal - killing, plundering and pillaging without any restraint appeared to be hallmarks of Forkbeard's conduct. King AEtherland, reigning King of England, paid Forkbeard's army massive amounts of silver to stay away after the series of terrible attacks. The payment became known as Dangold. Forkbeard took the treasure and headed back to Denmark. Upon his return home his Polish princess wife bore him a son, Cnut. Forkbeard however was not content with home life and his merciless raids continued. AEtherland (The Unready) King of England was sickened of Forkbeard's violence and greed, and called for the slaughter of all Danes- right down to the last woman and child- on a day now known as St Brice's Day. This proved to be a crucial mistake on AEtherland's behalf, as amongst the many dead was Forkbeard's sister, Gunhilda. It was AEtherland's intention to send a grave warning to Forkbeard's army to stay away, but all he did was invite vengeance on a furious scale. When Forkbeard learnt of the massacre he was in a state of inconsolable rage and swore to the Gods he would have revenge on King AEtherland and annihilate the people of England. He had the bow of his boat carved and painted like a serpent. He amassed his largest army, comprised of his finest warriors, and set course for England. When Forkbeard 's ships arrived in 1003AD, he and his men attacked fiercely and frenzied, desperate to avenge their fallen kin by killing and mutilating any who offered resistance- or not. Forkbeard and his army laid absolute waste, pulverising town by town; impaling enemies on pikes and further cruel and barbaric torture was committed. He exacted revenge in the same way he believed his fellow Danes were given and worse still. Once again King AEtherland began to pay the marauding Vikings off with Dan gold. The raids continued sporadically, until after ten years Forkbeard made a final return, landing in southwest England. He and his army met little resistance upon arrival, most people surrendered or fled, and so they began their march inland. This time Forkbeard had his sights set on London, and laid siege there for some time. AEtherland and his ally Thorkell (the Tall), himself a defected Viking, stood their ground firmly, but began to think of the harsh reprisals of the ever seething Forkbeard if they did not yield. A decision was reluctantly made not by the king, but by the English earls, who in a stunning move made Sweyn "Forkbeard" Haraldsson the King of England. The rule of Norway, Denmark and England was now in the hands of a warrior king. Forkbeard had power and wealth beyond his dreams. The once king, AEtherland, fled to exile, living out his days in Normandy. Sweyn Forkbeard Haraldsson was pronounced King of England on Christmas Day 1013AD. His reign was not an enduring one however. The circumstances surrounding his death are vague; it would appear he fell off his horse while riding through Gainsborough in Lincolnshire. Many accounts claim he was speared and left to die. Ultimately his ascension as sudden as his demise. His body was buried in England, and later exhumed and moved to Rosekild Cathedral in Denmark, where England's forgotten king remains.